Both of these brushes are based on the same texture but produce radically different strokes. Someone on Tumblr asked me how many brushes were in the PasteUp brush toolset. The answer seemed to surprise them: “Just one”. They, like many of us, are used to Photoshop brushes being of the stencil or stamp type, where you get an image of a brush stroke and every time you touch the brush to the image you get a ‘stamp’ of that image, perhaps in different sizes or at a different angle. The web is littered with this type of Photoshop brush. For digital painting though, you really want a smooth, variable pressure responsive stroke. 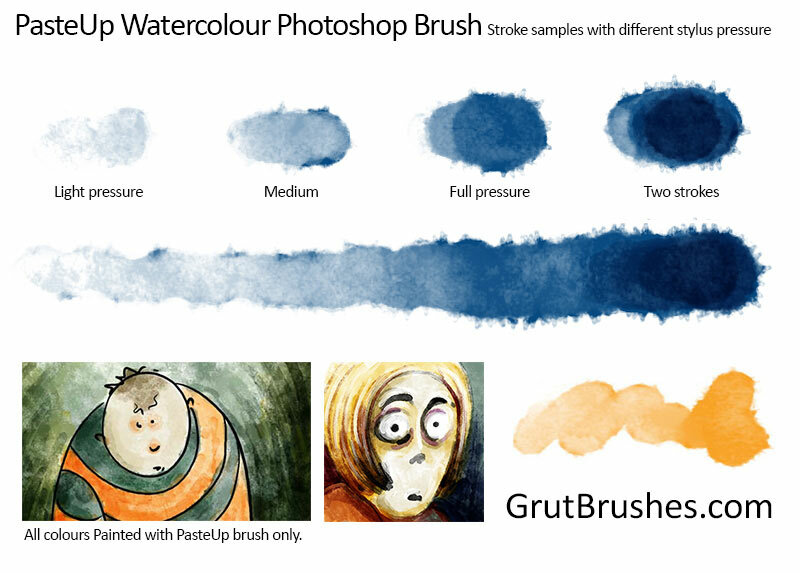 Grutbrushes are different, they are fully dynamic and pressure responsive brush toolsets that respond to the motion, direction and pressure of the stylus and the graphics tablet (Wacom, Monoprice, bamboo, intuos, etc) which means that each stroke will be fluid and unique as you paint with them. Here are a few examples of brush strokes painted with PasteUp watercolour brush illustrating the different strokes you can get just by varying the pressure you apply to your stylus. But enough from me, you can try it for yourself. You can still get it ‘free for a share’ for a few more days. Just add any Photoshop brushes you want to your cart, and from the cart, click on the share button for either Facebook, Twitter or Google+ and download them ALL for free! Don’t forget these three Photoshop brushes that are also totally free as well. No sharing necessary. 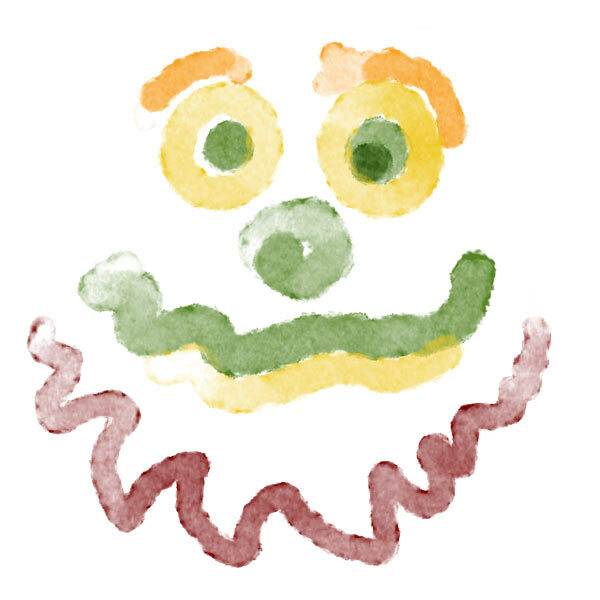 OK, this one’s the best watercolour brush. Maybe I spoke to soon or perhaps my latest Photoshop brush will always be my favourite. Pasteup has a rougher edge than the other watercolour brushes (with Frontier being perhaps the smoothest edged) PasteUp also has a tonal range that’s a bit higher than most, from very light to almost completely opaque depending on the stylus pressure. This makes it ever so slightly more challenging as it requires a bit more control to manage the opacity of the brush stroke but it still gives a pretty great looking natural watercolour effect no matter what you do. 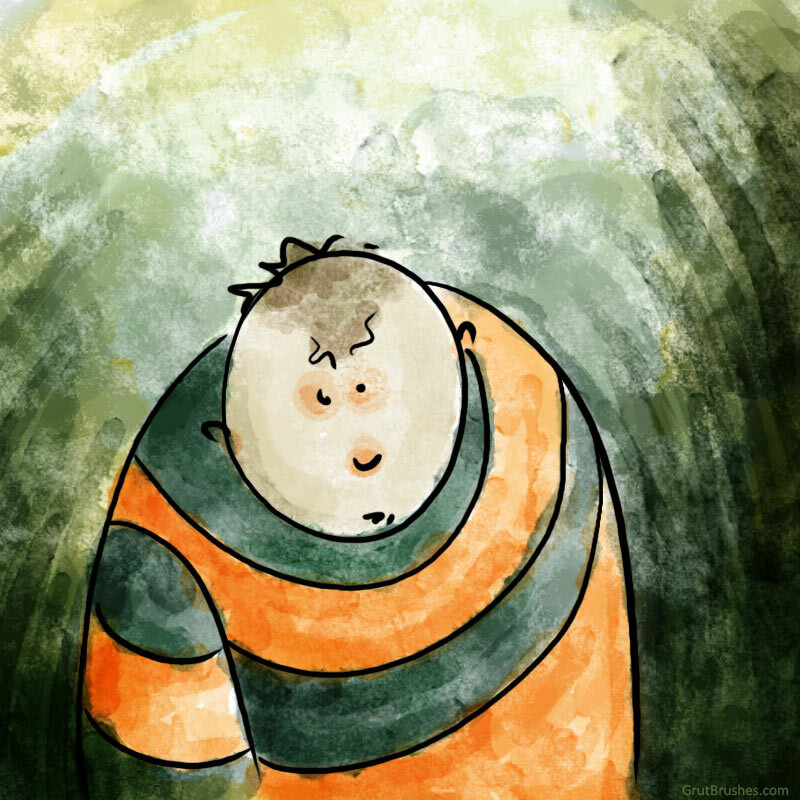 Here’s a Time-lapse video of the Striped Shirt Boy painting being painted with the Pasteup brush. The original painting took about 10 minutes to paint, it has been sped up here to last about 1 minute. 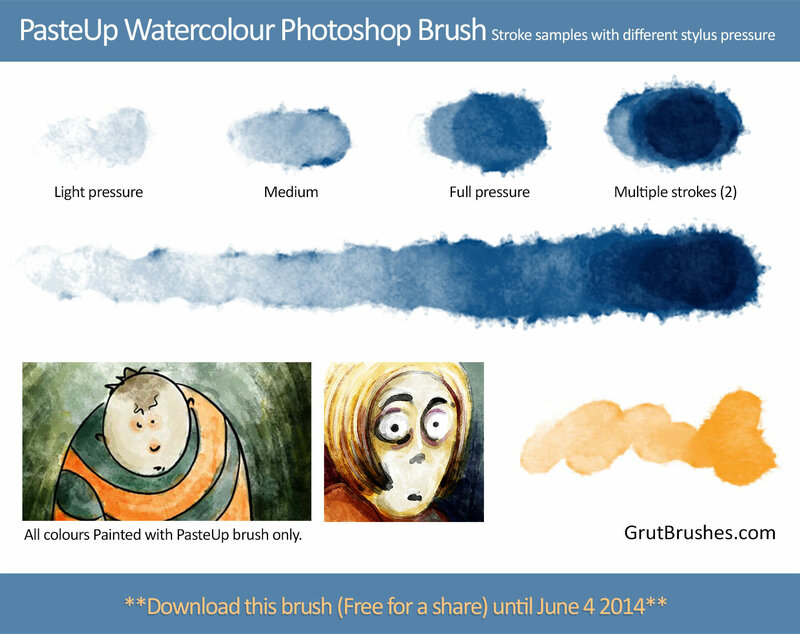 You can try Grutbrushes for yourself and download a free watercolor Photoshop brush here. 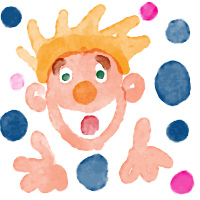 Best Watercolour Photoshop Brush Yet? This one was in the workshop for a long time but I am pleased to announce that “Swab Caress“, the latest and perhaps best of my watercolour brushes for Photoshop is now available in the shop. There are another dozen or so that are still in production that should be available within the next month or so. The latest watercolour Photoshop brush “Grape Remains” is now available in the shop. 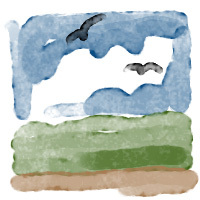 As with all brushes in the shop, it can be downloaded for free for a short while longer if you tweet, plus or like it on Facebook when you are checking out. Just add it to your cart and click on one of the social sharing buttons in the cart as you check out and you wont have to pay a penny to download the brush. If you’d rather not bother, you can buy it for just a dollar!